Load contents of filename as a “virtual” disk image. Address is unused for now. and the path separator may be / or \ depending on preference. Both work identically. Absolute paths or relative paths are OK.
3. EEPROM contents – anything can be loaded here. onwards must have the correct signature. 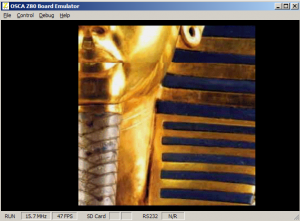 Planar Bitmap Mode, Raster IRQ and active palette. card identification requests and reset command. version”, but polled using a timer to aid debugging. Caution: This is experimental. Do not attempt to resize the window, or use the processor controls inside the debugger window, as these will likely crash the emulator, and who knows what else?!! 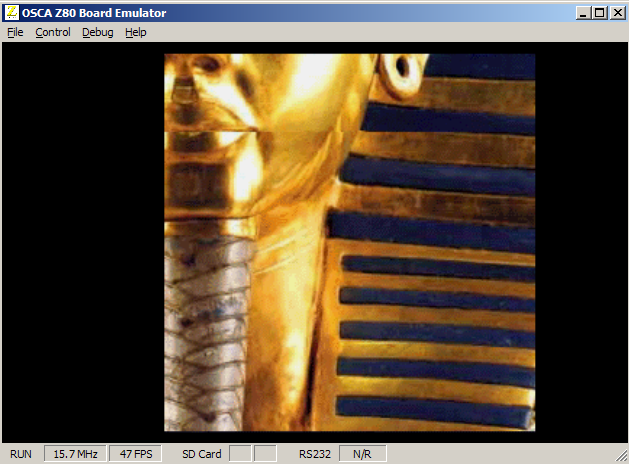 Firtsyl, thanks for this great little emulator!! Secondly, help! As per the config file. But the emu can’t find either!! And they are in the roms folder, infact I’ve not altered anything from the original download! Thirdly, is it still WIP? I’d love to see (hear) sound is being worked on! Weird, I deleted the config file, started again, put in it. 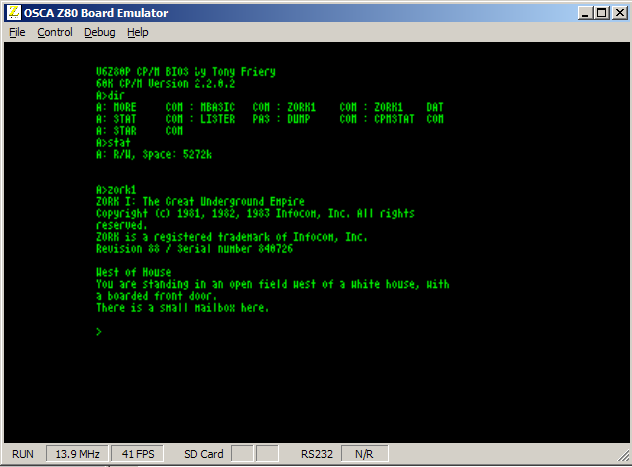 One thing though is how to create an img disk, and copy files onto it, I want to try Bounder and the spectrum emu etc. Strange – not sure why re-creating the file helped? 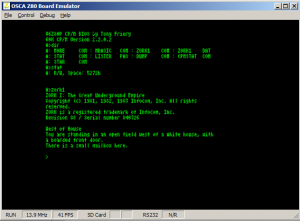 You won’t be able to try the spectrum emu – this is a different hardware configuration for the board that basically implements a spectrum, but at slightly wrong clock frequency. Not supported at all by the emu. As for Bounder, I thought that was on the sample disc image to be honest, but doesn’t work properly on the emu yet – still much to be completed!! IIRC, it uses an unsupported video mode (from an emulation perspective) as I’ve not emulated the tilemap modes yet. It is WIP, but the sound is presenting some issues at present. I’m not actively working on it as my main project, but I do come back to it from time to time. Also, forgot to mention before that as OSCA is constantly evolving (the hardware is based inside a programmable Gate Array, so can be modified through software), it’s a catch-up game to implement it all! Look forward to an updated version when it’s ready. Indrdible that the hardware was taken to The Breakpoint 2010 demo party with a nice little demo showing on it. Wish there was more available for the hardware, apart from the bloke who created it, there doesn’t seem to be much code about for it. I just downloaded everything and it works. However, after edit the file config.txt inserting value 0 on line specify an sd card image to mount “SDCARD 0 roms/flos.img”. Just one question: if i test my own software, how can I place it in the SD image? The first is to mount the image (you can do this under Linux using loopback, or Windows using a utility whose name I have forgotten – I will look it up again as I think one of my earlier mailing list posts made reference to it). The second (and imho simplest) is using WinImage which is a paid app unfortunately, which allows deleting and injecting files and directories through a gui and drag-and-drop. In time, I’d like to add virtual drive support (like UAE for example) but haven’t had time yet. I could also add a “load binary” option to allow injection of files into RAM if that helps? Thanks for the update DT!!! Yay, well sound works in Bounder, and VectorBalls2 demo. How do you load the mods and pt3 ones? Is their a tracker available, or do you have to load them into a specific address and exceute that address? Ignore aboave, found modplay.exe for it. Yup – modplay for playing mods, and imaginatively enough pt3play for playing pt3 files hehe. Again, thanks for the update. Let’s see what it’s like………. 1404:3A10 D3 06 F1 C9 F5 DB 06 CB-D7 D3 06 CD 98 48 F1 C9 ………….H..
1404:39A0 10 F9 C1 00 00 00 C5 ……. 1404:39C0 4F E5 CD 11 49 77 23 10-F9 E1 C9 40 00 00 00 00 O…Iw#….@…. 1404:39E0 2E 78 20 53 4E 3A 30 30-30 30 30 30 30 30 20 00 .x SN:00000000 . 1404:39F0 00 00 00 00 00 00 01 00-D3 0A DB 09 CB 77 20 FA ………….w . 1404:3A00 C9 3E FF D3 0A CD 0A 49-DB 0A C9 F5 DB 06 CB 97 .>…..I……..
..then obviously copy it in the SD image file. The patch just removes the quirk workaround. CD >>>> call get_byte ; skip first byte of nCR, a quirk of the OSCA V6 SD card interface? call get_byte ; skip …. Nice patch! I can easily change the reported OSCA version in the emulator – I chose not to do this because I didn’t implement the actual changes from OSCA, so it might mean some software doesn’t work as it relies on features not really implemented. Maybe in a future version I can add a config option to allow setting the reported OSCA version to whatever you like? Phil is now aware of the problem and the latest FLOS sources (in SourceForge) are patched in such a way that they are compatible with both the emulator and the real thing; I wouldn’t say it is a trick, he just cleaned up the earlier sync phase happening before a command is being sent to the SD card. 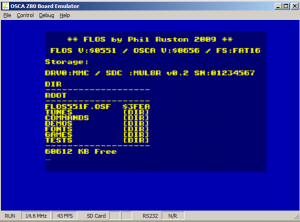 So the next FLOS version will be able again to boot with your emulator ! Thanks for the feedback Stefano – I guess I misread your earlier post! I thought this was a problem with the version reporting, but I understand now it’s the SD card reading. I must say, Phil deserves a prize for his continuous support of FLOS – top stuff! Out of interest – do you plan to support the Z88DK on the V6? 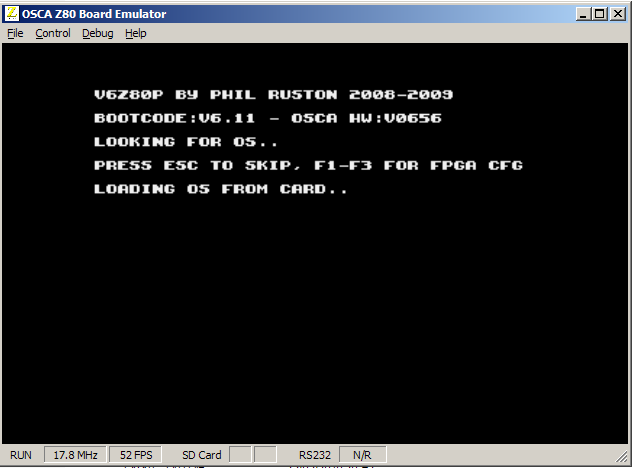 Will it run only in your OSCA-Emulator or also in the original V6Z80P? It isn’t available for download currently. Unfortunately I lost the source code to it, so I’ll have to dig around and see whether I can find the package in my email or something. If I can find it then I’ll certainly make it available and let you know! 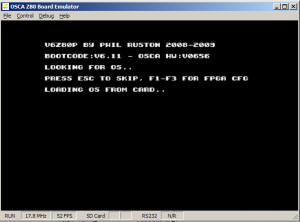 It will run on an original V6 board (or certainly used to), although I haven’t tried it with newer versions of the OSCA configs – If I recall correctly it required a disk image to be raw-written (using dd or rawrite) to the SD card, so you’d need a spare card to use it. do you know how to create a working sdcard on real hardware ?